Easy, healthy, and comforting Instant Pot Red Lentil & Potato Curry! 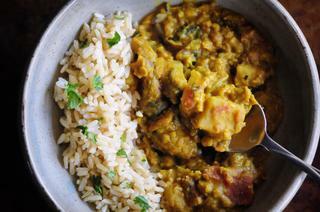 This delicious Indian-style pressure cooker meal is gluten-free, vegan, and packed with delicious warming spices ready to complement your favorite grain and/or bread! As you've probably noticed by now, I am a huge curry fan. It is my ultimate ideal comfort food. 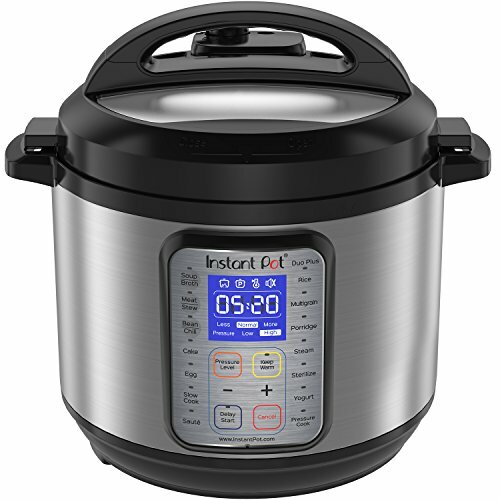 And, I've also grown quite fond of my Instant Pot. And what do ya know!? The two combine absolutely perfectly. The Instant Pot has definitely become my preferred way of cooking a curry as all of the ingredients tend to come out wonderfully tender, with a delightfully creamy texture, and in much less time than conventional methods. Win! This curry is heavenly. I wanted to add a little extra creamy and filling goodness to my red lentil base; and potatoes worked beautifully! If you're in need of a bit of healthy and delicious comfort food, whip this up and serve alongside some rice, quinoa or naan bread and you will not be disappointed with its perfectly spiced goodness. Turn your Instant Pot on to sauté mode.Add in oil, onion, and garlic. Sauté, stirring frequently, for 5-7 minutes or until onions are turning translucent.Stir in spices cilantro through cloves. Sauté 1-2 minutes longer (until fragrant).Pour in water, lentils, and tomatoes. Stir to combine.Cook on Manual High Pressure for 15 minutes.When finished - press cancel, let pressure valve drop, quick release pressure, remove lid.Stir in potatoes, optional shredded coconut, coconut milk, and fresh mixed greens.Cook on Manual High Pressure for 15 minutes longer.Quick release pressure once again.Stir in apple cider vinegar.Salt to taste.Serve and enjoy! NOTE: I created and have only made this recipe with a 6 quart Instant Pot. While I have a received a lot of positive feedback on this recipe, some of those using 8 quart Instant Pots have encountered a ‘burn’ error message. However, they have told me that adding 1-2 cups of more liquid resolved the issue and resulted in a favorable outcome. So if you are using an 8 qt you might want to add a little more liquid from the get-go! As always, I would love to hear your feedback and experiences! xo.